With bases in Perthshire and Aberdeenshire, Scotland, All Terrain Ventures Engineering can supply the entire Yamaha range of utility and sports ATVs and quad bikes, from the massively powerful Grizzly 700, right down to the entry level Grizzly 125, suitable for beginners and older teenagers. We can also supply any make or model of quad bike or all-terrain vehicle, including quad bikes from Suzuki, Honda, Kawasaki, Arctic Cat and Polaris. For the utility ATV owner we can supply a full range of attachments to turn your quad into a complete workhorse for all occasions. We also have a huge collection of ATV and quad bike spares and accessories, built up over many years trading. These can be searched and purchased through our online shop. Whether you need a basic utility quad or a top of the range sports model we can advise, supply and service it. 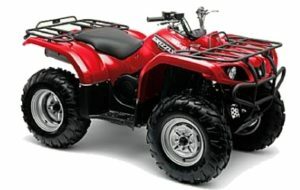 Whatever your ATV requirements, contact the experts first.